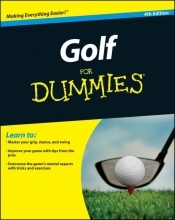 Golf For Dummies, 4th Edition, gives you all the latest information on the game, including updated expert advice on everything from improving fundamentals to mastering the game`s mental aspects. Part I: Welcome to a Mad Great Game. Chapter 1: Why Play Golf? Chapter 2: Choosing Your Weapons Wisely. Chapter 3: Taking Golf Lessons (And Other Sources of Help). Chapter 4: Getting in Golf Shape. Chapter 5: Where to Play and How to Fit In. Part II: Getting Into the Swing. Chapter 7: Improve Your Move: Refining Your Swing. Chapter 8: Chipping and Pitching: Short-Game Secrets. Chapter 9: Putting: The Game Within the Game. Chapter 10: Bunker Play: It`s Easy (Really!). Part III: Common Faults and Easy Fixes. Chapter 11: Did I Do That? Solving Common Problems. Chapter 12: Beating Bad Breaks and Bad Weather. Part IV: Taking Your Game Public. Chapter 13: Step Right Up and Play! Chapter 14: Rules, Etiquette, and Keeping Score. Chapter 15: Gamesmanship and Sportsmanship. Chapter 16: Stepping Up Your Game. Part V: How to Be a Smart Golf Consumer. Chapter 17: Watching Golf in Person. Chapter 18: Golf on TV. Chapter 19: Getting Your Golf Online. Chapter 20: Screen Gems: Surveying the Best of Virtual Golf. Chapter 21: Golf`s Ten Commandments. Chapter 22: Gary`s Ten Favorite Courses. Chapter 23: Gary`s Top Ten Male Players. Chapter 24: Gary`s Top Ten Female Players. Chapter 25: Ten Immor tal Golf Moments.